"He(Fisichella)is very angry now and I understand this, as the mistake was my fault." It seems that the young Olivier Panis having been bestowed with unerring pearls of wisdom from Guru, team boss and four times world champion Alain Prost and the emotional Rubens Barichello, fathered and molly-coddled by Dad Jackie in the upstart Stewart Racing team, have both given the Formula one fraternity the novel prospect of mid-running teams threatening to take over the positions in the traditional latter half of the top four. It just goes to show, that if you treat your pets right they will reward you in the end. With extremely poor showings from both McLaren and Benetton in qualifying, the grid for the Argentinian Grand Prix is peppered evenly with the grand and the not so grand. The tyre war that looked so benign in Melbourne, is gradually developing into a critical factor in the final positioning on the grid and even allowing for the supersonic capabilities of the Williams FW19s, the decision to use soft Bridgestone rubber by both Stewart and Prost, has undoubtedly given them a distinct advantage. The choice of a hard Goodyear compound by the Benetton team and a time over two and a half seconds slower than pole meister Jacques Villeneuve illustrates this point well. Gerhard Berger said after qualifying 12th, a mere 3 hundredths of a second in front of the wayward Arrows of Damon Hill,"I think that first of all, we made the wrong choice of tyres. During the session the sun disappeared and it got a little bit cooler. Therefore, it would have been better to run on soft tyres". Technical Director Pat Symonds agreed but, trying to explain his mystifying decision to take the hard line, he said, "We decided that we wanted to run on hard tyres, a decision which is always going to give you some disadvantage in qualifying. But we hope that it might give us a chance to catch up tomorrow in the race." This however, proved to be the wise choice as, with a track temperature climbing from 31 degrees at the start to over 35 by the finish, the softer compound Goodyears began to blister. Hard or soft tyres, light or heavy fuel loads, one, two, or three pit stops, the mix was perfect and, as the red lights went out, Villeneuves Williams predictably made a perfect dash for the first corner. The Canadian, suffering as Hill did last year, from a severe dose of the trots, was clearly keen to get the race over so that he could resume his enforced relationship with the bathroom. Still, true to form, the coming together of Carbon fibre was inevitable. This time it was the other red Ferrari. Rubens Barichello in the Stewart making a good getaway, was harried into the long right hander by Michael Schumacher trying to dive down the inside. Understeering badly he careened wide and into the Stewart Ford. "I got off the line ok and was running wide at the end of the straight to keep out of trouble," Said Barichello afterwards, "but suddenly I just felt a touch on my rear wheel, so I presumed that was Schumacher. It took me off - I spun and lost the nose cone." Schumacher sensing a red flag situation sprinted back to the pits with the hope of re-starting in the spare car. The race was deemed yellow however and the Safety car was brought out and an extremely angry German disappeared into his motor home. In the ensuing mayhem, cars were diving for the dirt and any piece of grass verge to avoid the carnage. Separate accidents occurred when the other Stewart of Jan Magnussen had a collision with the Sauber Petronas of Nicola Larini and the West McLaren of David Coulthard lost a wheel in a brush with Ralf Schumachers Jordan Peugeot. "Either Hakkinen or Coulthard touched me on the right tyre with his wing." He said, "I thought he had destroyed it, but I was lucky." Coulthard wasnt lucky and echoed his premonitions back in the pits, "I expected something in the first corner but not this." The Benetton of Berger did not escape either. Taking to the dirt, he was pushed to the back of the line, "I got involved in the accident and basically I started the race from the end", he said later. With a painfully slow pace car keeping the snaking bunch in check, thoughts of Imola in 1994 came to mind (when Ayreton Senna crashed and died immediately after a similar situation involving a slow pace car) and as tyres cooled and engines overheated on a track that was rapidly warming up, it was imperative that the race got underway with the shortest possible delay. Frentzen having lost a full two seconds in the first lap after suffering clutch engagement problem at the start of the warm-up lap, was now back on Villeneuves tail and ever watchful for the lights of the pace car to go out. Lap 4 saw the race resume and by lap 5, Frentzen was coasting to a halt with his Drivers Disengagement System malfunctioning again, leaving him with no drive and once again no points. Olivier Panis was boiling now and, looking to catch Villeneuves Williams, started making initial gains of three tenths of a second a lap. Unusually, Irvine had stayed clear of the fracas, choosing to collect dirt on his tyres rather than tangle with a slow starting Frentzen. "I was half alongside Frentzen and I couldnt overtake him. I didnt want to stay out that wide, so I had to back off and pull in behind him, because I was out in the dirt. That slowed me down for the first couple of laps," He said later, "as the fuel came off and the tyre pressures came up, the car came good." Meanwhile the Jordan twins of Ralf Schumacher and Giancarlo Fisichella were making extremely good progress behind the front three and looking strong for a double point tally. By lap 14 both Panis and Villeneuve had traded fastest laps and track records and it was clear that this weekend at least the Frenchman was getting the better deal out of Villeneuves Stomach bug. Damon Hill, again driving magnificently in 7th place in a car quite frankly not fit for the track, having had no time for any form of set-up due to a water leak during Saturday qualifying, was keeping his head down and holding off an agitated Jean Alesi and it was set in stone that he would have a crazy crack at passing Hill at the earliest opportunity. This he did on lap 16 in a pointless and premature manoeuvre that left them both spinning in the dirt on both sides of the track. They both got away, with Hill losing 4 places. 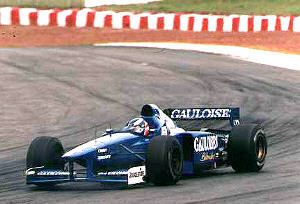 Lap 18 saw the cruellest retirement with Olivier Panis cruising to a halt with a hydraulic fault. A faultless drive such as his should have been rewarded with a podium finish but it is only a matter of time now before this resurgent Honda/Panis combination comes out on top. The first of the pit stops were made on Lap 22, Villeneuve pulling out of the pit lane barely a car's length in front of Irvines Ferrari. The Ulsterman was to pit a lap later, in turn handing second place to a charging Giancarlo Fisichella. The battling Jordan chums obviously wanting to make their off-track coolness a touch chillier, managed to get entangled a little further round the bend. In a futile attempt to find space on the inside at turn 3 Schumacher knocked his teammate for six, sending him spinning out of a well deserved 2nd spot. Young Ralf showing uncomfortably similar traits that his older brother Michael demonstrated throughout the 94 season arrogantly dismissed any concept that it could have been totally his fault, "He(Fisichella)is very angry now and I understand this, as the mistake was my fault." He could have left it at that but added a rather barbed, "He made a mistake in the corner before the back straight, and I thought he really opened up the gap, and then he closed the door. We have to talk about that later." Pity poor innocent Giancarlo who until then had not put a foot wrong. Down the road, Rubens Barichello was shutting up shop for the day and must have been a great disappointment for Jackie Stewart after such a promising drive. "I lost a mirror," said a continually optimistic Rubens, "It came into the cockpit and as it had a cable on it, I had to pull hard to get rid of it and lost a lot of time. Then I just lost the hydraulic pressure. A pity because today would have been a podium, not just points." 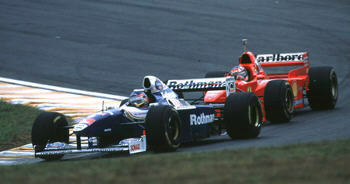 Meanwhile Alesi was at it again scrabbling past Hill and going wide, allowing the World Champion to retake his position. Alesi put it down to gear shift problems "I started to have problems shifting down: the gears locked and this made me go straight into the dirty parts of the track. I had constantly to try to clean my tyres." This did not prevent him from doing a fastest lap however and to spare him further aggravation, Hill retired his car on lap 33-his 3rd DNF in a row. "I got an overheating problem and then I lost air pressure which meant ...the engine broke and I had to stop." He honestly didnt seem to care although he probably did. Along with team mate Pedro Diniz, who retired with another blown Yamaha 17 laps later, he hadnt had a good weekend. An underachieving chassis, an engine with no power and a lot of human error on the team's part, is no great advert for the seemingly redoubtable reputation of Tom Walkinshaws outfit. It says much for Hills skills as both driver and diplomat that he has not yet walked away in disgust. With the second pit stops up and coming and both front Bridgestone runners out of the race, the result seemed like a forgone conclusion but with a track temperature approaching 35 degrees, Williams Renault having elected to use the softer compound Goodyears, was starting to have major handling problems. "We chose the wrong tyres." Said Villeneuve afterwards, " With more rubber on the track towards the middle of the race we suffered understeer, consequently blistering the tyres, so it was very difficult to keep the others behind. We planned to do three stops but were not expecting anyone to do one, so were a bit surprised and it almost caught us out." Villeneuves second pitstop left Eddie Irvine to run free in first place for six laps before he made his second stop. Schumacher in the Jordan benefiting from the hard choice of tyres and a single pit stop, was easily outrunning the straggling 3 pack of Herbert, Hakkinen and Berger by over 15 seconds who in turn were all linked overall by barely 2 seconds. The position was not to change and as Irvine gave up his lead in the pit lane, Villeneuve managed to put enough distance between him and the Ferrari to maintain his lead despite a third splash and dash stop. In the final six laps with Villeneuve nursing his tyres to the chequered flag Irvine put on a charge that briefly brought the race back to life and at one point was less than a cars length from the Williams rear wing. "I was under his wing coming out of the last corner," explained Irvine, "but he left me for dead on the straight. I was on the limiter going accross the start-finish line and there was no way I could overtake him unless I just barged into him." In view of what happened at Melbourne, that would probably give Villeneuve full licence to murder the Irishman but luckily commonsense prevailed and the two cars crossed the line a mere nine tenths of a second apart. With the top six places going to six different constructors and the introduction of the Bridgestone factor, it is now becoming obvious that the lions of yesterday are not able to pick off their pray with the consummate ease with which they used to do. There is less room at the watering hole, now that the small teams are pushing to slake the thirst that so many dry seasons have brought on. A final word can go to Eddie Jordan whos Jordan Peugeot team has survived 100 races and has still yet to quench his thirst for glory. "I have mixed feelings about todays result, as we could have had more points. But it is fantastic to be on the podium and, perhaps more importantly, to see that we have a car, an engine and tyre combination which is capable of running at the front. My neck is on the block, but I think it will turn out OK. It is a good way to celebrate our 100th Grand Prix. A podium finish is what we needed."